Evernote is one of the most popular, powerful note taking tools Is OneNote for Mac a Viable Alternative to Evernote? Is OneNote for Mac a Viable Alternative to Evernote? 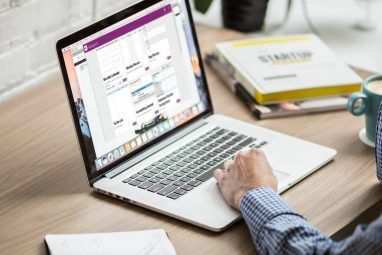 Even you're a diehard Mac or iOS user, you still may find the stylish Microsoft OneNote for Mac, iPad and iPhone a worthy option for capturing notes and creating page designs. Read More out there. From the web and desktop applications to syncing with phones and tablets, Evernote is a superb source for capturing, keeping, and referencing your thoughts, ideas, and important notes. As an Evernote user for six years, I can attest to how easy it is to let items get cluttered. It certainly is not the fault of the application, because Evernote does provide the necessary features 20 Evernote Search Features You Should Be Using 20 Evernote Search Features You Should Be Using It's one thing to use Evernote, but it's entirely another thing to master Evernote. 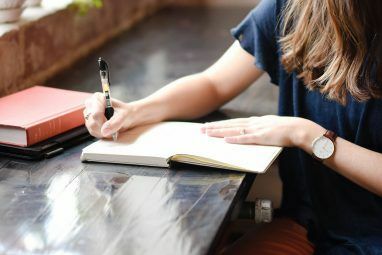 If you’re new to Evernote, I don’t want to come across like it’s something complicated – it’s not, in fact, it’s... Read More to keep everything nice and neat. But, we all know that it can become like the junk drawer in your home. You have to clean it out and organize it every so often because items just tend to get thrown into it. 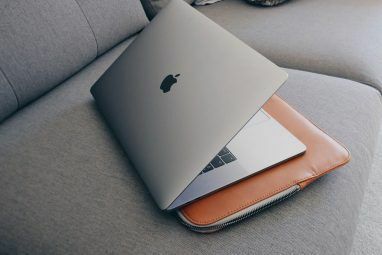 It is possible that you have entire notebooks full of notes How & Why I Use 5 Digital Notebooks to Stay Productive How & Why I Use 5 Digital Notebooks to Stay Productive I use five different notebooks. Why? Because each has a distinct purpose or feature that helps me stay productive. Read More that you no longer need. The point is to eliminate those that you know for certain you no longer need. Short little notes Lighter And Smoother Note-Taking -- See What Evernote Has Lined Up For You Lighter And Smoother Note-Taking -- See What Evernote Has Lined Up For You Ever wished Evernote had a simpler, easier-to navigate Web interface? Your wish has been granted. Evernote Web just had a makeover, and it appears refreshingly zen in its latest avatar. Read More about picking up milk last week or an article idea you used three years ago are those types of easy-to-clean items. Create a note with a reminder to do a cleaning Make The Best Use of Evernote with Automated Note Reviews Make The Best Use of Evernote with Automated Note Reviews Evernote is useful as a brain dump. But it doesn't have a useful process for reviewing your content, which means lots of valuable information can be forgotten. Now, there's a solution. Read More every month, quarter, or even once a year. If you follow the Tips for Future Use above, clean-ups down the road should go much faster and smoother. 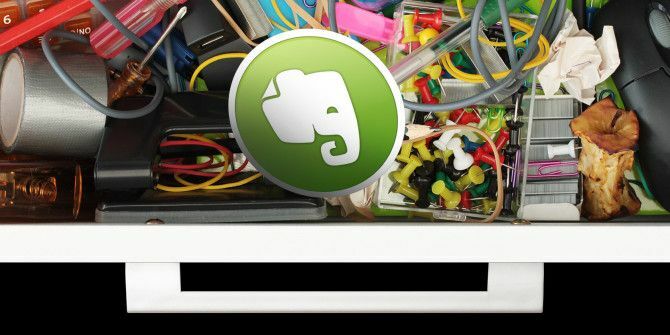 Remember, Evernote can get like that junk drawer, like it or not, so try to keep it better organized between cleanings and the next one will not take nearly as long. Plus, you have a better chance of finding the things you need in the meantime! Are you a heavy Evernote user Get Creative With Evernote: 10 Unique Uses You Haven't Thought Of Get Creative With Evernote: 10 Unique Uses You Haven't Thought Of Evernote is one of the ultimate tools in productivity, and with a wide variety of multiplatform apps, there's no limit to the way that you can use the service. We're big fans of Evernote here... Read More who has some other suggestions to share? Maybe you have a different, sure-fire way to keep notebooks, notes, and tags free of clutter. Please feel free to share your comments and suggestions below. We would love to hear from you! Explore more about: Declutter, Evernote, Note-Taking Apps. I've been going through my Evernote notes over the past week or so, and it's a huge undertaking! This article has been really helpful, though. One of the things that I've been finding that I need to do is re-clip a lot of articles. I don't know if the web clipper has gotten better, or if sites have just changed, but quite a few of my clipped articles looked terrible until I reclipped them. Especially if they came from Pocket. Why waste any time or cognitive resource? This is digital data, and tools with filtering capabilities. Dispense with any folders and just save the item with a pertinent tag or two. You can then simply search for that tag and instantly see what you've saved. And don't forget, these tools have full text search, so you can search for words in the content as well. Now, your most important resource -- your time, is conserved because you're not sitting around wondering what folder to save something, or what folder you saved something in. You just save it or grab it, with little thought.